Muscle relaxation as an adjunct to anesthesia. Guaifenesin is commercially available as oral powder 2gm and injection 50mg/ml. Guaifenesin is a centrally acting muscle relaxant that is used as a part of many anesthetic protocols in the horse. Its mechanism of action is not precisely known but the relaxation of skeletal muscles, mild analgesic and mild sedative properties allows for lower doses of other sedatives and anesthetic agents. Guaifenesin is used for induction before inhalation anesthesia, during inhalation anesthesia and with total intravenous anesthesia (TIVA) for short procedures. Guaifenesin has minimal effects on diaphragmatic function and produces relatively little respiratory depression at normal doses. It is used primarily in horses although it has been studied and is used in other domestic species. Guaifenesin within a Triple Drip combination also is administered with inhalant anesthesia as a means of reducing the total amount of inhalant used in a given case. This combination of intravenous and inhalant anesthesia is referred to as "balanced anesthesia." Balanced anesthesia has the advantages of less cardiovascular depression, diminished need for additional drugs to support hemodynamics and improved recoveries. Guaifenesin may cause a mild decrease in blood pressure and an increase in heart rate. There are conflicting reports regarding hemolysis and reactions of the vascular endothelium with higher concentration solutions of guaifenesin. Guaifenesin has been shown to cross the placenta. 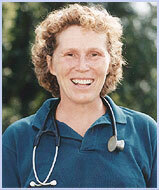 Neonatal levels immediately after delivery were about 30% of the level in the mare. TIVA with Triple Drip has been used successfully in field situations for dystocia. Appropriate ventilation and respiratory support for the foal may be necessary. Donkeys and to a lesser extent mules may be more sensitive to guaifenesin. Mules are reported to be intermediate between horses and donkeys. Perivascular administration will cause tissue reaction. Guaifenesin should be administered using an intravenous catheter. Guaifenesin is relatively safe. The margin of safety is reported to be three times the normal dose and cardiovascular side effects are rare. Signs of overdose include apneustic breathing, nystagmus, hypotension and increased muscle rigidity. Although there is no specific antidote, Guaifenesin has a relatively short half-life (60 to 85 minutes) (Plumb 2005). Supportive treatment should be instituted while the drug is being cleared.